The medulla oblongata, often simply called the medulla, is an elongated section of neural tissue that makes up part of the brainstem. The medulla is anterior to the cerebellum and is the part of the brainstem that connects to the spinal cord. It is continuous with the spinal cord, meaning there is not a clear delineation between the spinal cord and medulla but rather the spinal cord gradually transitions into the medulla. What is the medulla oblongata and what does it do? For most of the 18th century, the medulla oblongata was thought to simply be an extension of the spinal cord without any distinct functions of its own. This changed in 1806, when Julien-Jean-Cesar Legallois found that he could remove the cortex and cerebellum of rabbits and they would continue to breathe. When he removed a specific section of the medulla, however, respiration stopped immediately. Legallois had found what he believed to be a "respiratory center" in the medulla, and soon after the medulla was considered to be a center of vital functions (i.e. functions necessary for survival). Watch this 2-Minute Neuroscience video to learn more about the medulla oblongata. Over time, exactly which "vital functions" were linked to the medulla would become more clear, and the medulla would come to be recognized as a crucial area for the control of both cardiovascular and respiratory functions. The role of the medulla in cardiovascular function involves the regulation of heart rate and blood pressure to ensure that an adequate blood supply continues to circulate throughout the body at all times. To accomplish this, a nucleus in the medulla called the nucleus of the solitary tract receives information from stretch receptors in blood vessels. These receptors---called baroreceptors---can detect when the walls of blood vessels expand and contract, and thus can detect changes in blood pressure. When baroreceptors send signals indicating that blood pressure is deviating from a desired range, then reflexive mechanisms are enacted to return it to equilibrium. For example, when a fall in blood pressure is detected by baroreceptors, they send information regarding such a change to the nucleus of the solitary tract. The nucleus of the solitary tract then activates neurons in the ventrolateral medulla that control sympathetic nervous system innervation of neurons that increase heart rate and blood pressure. At the same time, inhibition of parasympathetic activity ensures there will not be a conflicting drive to lower heart rate and/or blood pressure. Overall, these reflexive actions ensure that critical organs like the brain will not be affected by transient fluctuations in blood pressure. There are also neurons in the medulla that receive information from receptors called chemoreceptors, which are found within blood vessels and can detect changes in the chemical composition of the blood. These chemoreceptors can recognize changes in oxygen and carbon dioxide levels, and medullary neurons use this information to respond to oxygen need by increasing respiration. These neurons are found in and around the nucleus of the solitary tract and another nucleus in the medulla called the nucleus ambiguus. 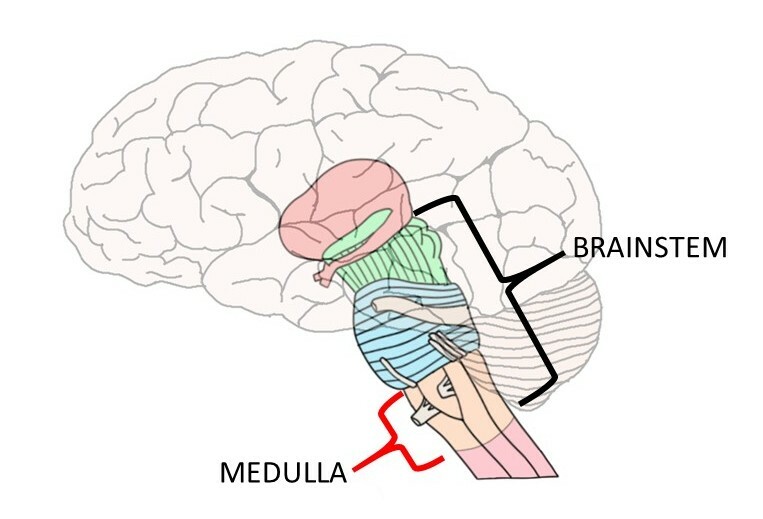 The medulla isn't only involved in adjusting respiration in response to need, however; the medulla also generates normal breathing movements by stimulating the nerve that supplies the diaphragm. This stimulation begins at around 11 to 13 weeks of gestation in humans and continues until death. While these cardiovascular and respiratory centers are clearly what led 19th century neuroscientists to consider the medulla the center of vital functions, the full range of activities of the medulla is considerably more diverse. In addition to the reflexive cardiovascular and respiratory actions mentioned above, neuronal groups in the medulla are also responsible for other reflexive actions like swallowing, coughing, sneezing, and vomiting. Vomiting is controlled by an area of the medulla called the area postrema, which is not protected by the blood-brain barrier. This lack of blood-brain barrier protection allows neurons in the area postrema to come into contact with the blood. By doing so, area postrema neurons can detect potentially toxic substances in the blood and trigger vomiting if present. There are a number of other important nuclei in the medulla. Several cranial nerve nuclei are found there, as well as the inferior olivary nuclei, which are densely interconnected with the cerebellum and thought to play a role in motor control. The nucleus gracilis and nucleus cuneatus are both found in the medulla; they are important nuclei along a pathway called the dorsal columns-medial lemniscus, which carries sensory information to the brain. The medulla's position as the lowest part of the brainstem also causes it to also be a conduit for a number of tracts that pass from the spinal cord into the brainstem and from the brainstem into the spinal cord. For example, the corticospinal tract---a major descending tract for voluntary movement---passes from the medulla into the spinal cord. The corticospinal tract and another tract called the corticobulbar tract, which is involved with movement of the head and neck, form triangular bundles of fibers in the medulla that create ridges on the outside of the brainstem. The bundles and associated ridges have been termed the medullary pyramids, and the corticospinal and corticobulbar tracts are often referred to as the pyramidal tracts because of their association with the pyramids. At the junction of the medulla and spinal cord, the corticospinal tract decussates, or crosses over to the other side of the body, before continuing down into the spinal cord. The location of this decussation is referred to as the pyramidal decussation. Thus, the medulla oblongata's functions are extraordinarily diverse and include those that are essential to life as well as to other important activities like movement. Due to its role in regulating vital functions, however, you could make the argument that the medulla is perhaps the most important area of the brain.